More than one dozen football players have been booted from a South Bay college for a rules violation, but some say the dismissals could have been racially motivated. 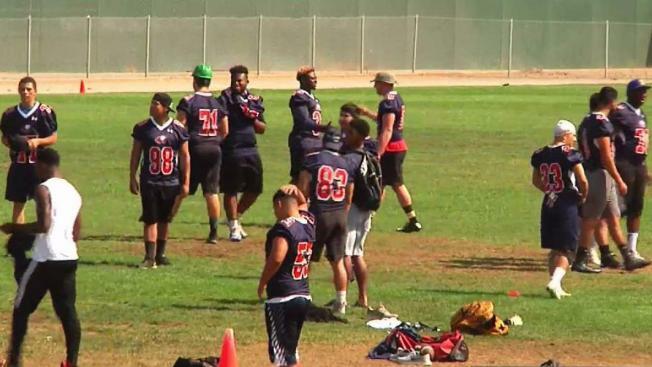 A total of 17 players — all but one being African American — from Gavilan College in Gilroy were kicked off the team for allegedly accepting one month of free housing. The players were living in a three bedroom house in Hollister under the agreement that they would purchase their beds and other supplies in lieu of paying rent for the month of August. The men were going to start paying rent in Septemeber, but before that date, the college dismissed them from the team, arguing that the living arrangement violated state athletics association rules. Terence Cherry, who has dismissed from the program and has since returned home to Baltimore, believes that race played a role in the dismissals. "It's something in the mix, but we just going to have to dig and figure it out," he said. "They say what's done in the dark comes to the light, and I'm a firm believer in it." Jan Bernstein Chargin, a spokesperson for Gavilan, vehemently counters those claims. "Race was not a factor," she said. "The only factor was the CCCAA regulations. They apply to every college, and we are no exception. We have to follow the rules." The owner of the home, who did not want to be identified, did not agree with the spokesperson's view. The homeowner said the players did not receive free accommodations, purchased their own bunk beds and also did not receive any free food. The investigation into the matter has concluded, according to the school. The athletes were offered a chance to stay at the college as students, but they all declined. They have since returned to their respective hometowns on plane tickets paid for by the college.